Are Your Resolutions Ready? Here Are Mine! 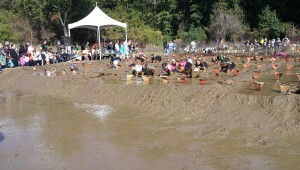 Will a mud run be my race of choice for 2013? It’s New Year’s Eve! Are your resolutions ready? While some people don’t make resolutions, I always have because I find that it’s nice to set goals for the new year. Something about starting a new year with a clean slate and endless possibilities. And when it comes to resolutions, I find that it helps to be more specific with goals so it’s easier to measure success. Check out my aspirations for 2013 and shares yours in the comments! 1. Cross an item off my fitness bucket life. We came up with fitness bucket lists over on FBG earlier this year, and I’d love to cross an item off. I’m thinking that the rock-climbing wall will be it. 2. Run another race. I ran not one but two races in 2012 and was shocked at how much fun they were. I plan to harness my running mojo and hit up another one in 2013! 3. Find more balance. This one will be a hard one to measure, but it’s more of a feeling than anything. I know I’m totally out of whack with work/life balance right now, but I’m hoping that daycare will be one solution that will help me get a little more organized and on the right track again. 4. Take yoga classes. I’ve gotten away from yoga for the last couple of years, and while it’s not my equivalent of a workout BFF, I do like how I feel when I’m doing it and doing it more regularly. I’m going to try to hit up some classes at the gym in 2013. Who knows, maybe it’ll also help me find more balance? 5. Less processed, more whole. I haven’t been an angel when it comes to snacking lately. In the New Year, I’m planning to graze on more whole fruits and veggies as snacks, instead of grabbing a cookie here or chips there. I’ll be trying to save any splurges for the evening and make my daytime snacking as healthy as possible. I’m a sucker for a clean slate, so I love resolutions as well. I’ve got a lot of the same goals (including less screen time); and I’m with you on the yoga… I love the way I feel afterwards but make so little time for it. No more. Happy new year!